How to flash Xiaomi Mi A2 or Mi 6X? In this tutorial we will show you all possible solution and method of Hard Reset and Factory Reset Protection (FRP) of Xiaomi Mi A2. Xiaomi Mi A2 after flash and hard reset it ask to enter Mi cloud account id and password, if you forgot the Mi Account Id and password you can recover or reset password by following the official page of Xiaomi such as [Mi Cloud] [Mi Account Reset Password] [Mi Account - Sign in Global]. If you unlock the Xiaomi Mi phone using official methods by following the above site links, then it's safe and the warranty of the phone will not void. 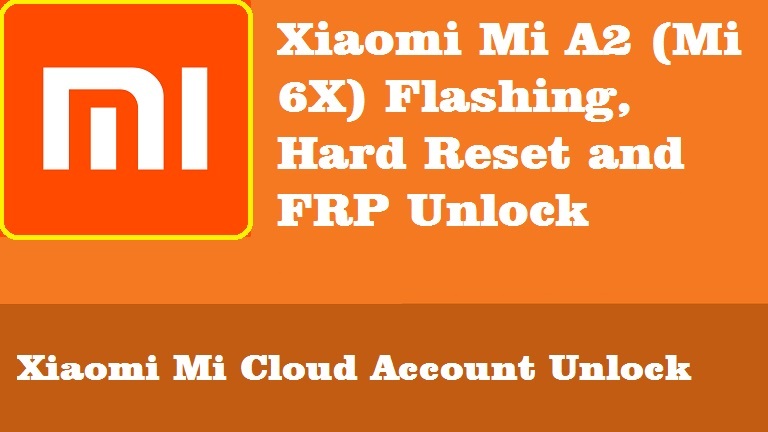 But if you still facing problem to reset or recover your Mi cloud account details, then you can follow these steps to unlock Mi account or FRP unlock Mi account. You can unlock Xiaomi Mi A2 smart phone by flashing with firmware and Mi flash tool or you can use an Flashing Tool Box and which causes void warranty of the phone. Note: Always try to recover you Mi cloud account by visiting the official page with official way. Download Xiaomi Mi A2 Firmware and Mi Flash Tool [MIUI ROM Download] [Mi Flash Tool Download]. Now put the phone in to Download/EDL Mode or Fastboot Mode. Open Mi Flash Tool and give the firmware path. Now click on Start and wait until the flash process complete. You can use RB Soft Mobile Tool to hard reset and Unlock [Link]. Open the Xiaomi Mi Unlock tool. Now boot the phone into Recovery Mode ( Press Volume Up + Power Key and then choose Recovery or Connect with Mi Assistance). Now format user data and do frp reset by using this tool. You can also use Miracle Box latest version (Miracle Box required), Download Miracle Box free version working without box Here. Open Miracle Box Tool Software. Go to Qualcomm Tab and then Extra and select Mi Account Unlock and choose your phone model number. Click on Start button and wait until the Unlock done. You can use UMT flash tool box to Unlock Xiaomi Phones. You can also try NCK box to flash, hard reset and unlock account Xiaomi cloud. You can use Falcon box for Mi Account Unlock. To flash, hard reset and unlock Mi account you try the above methods at your own risk, we are not responsible any damage happen to the phone.